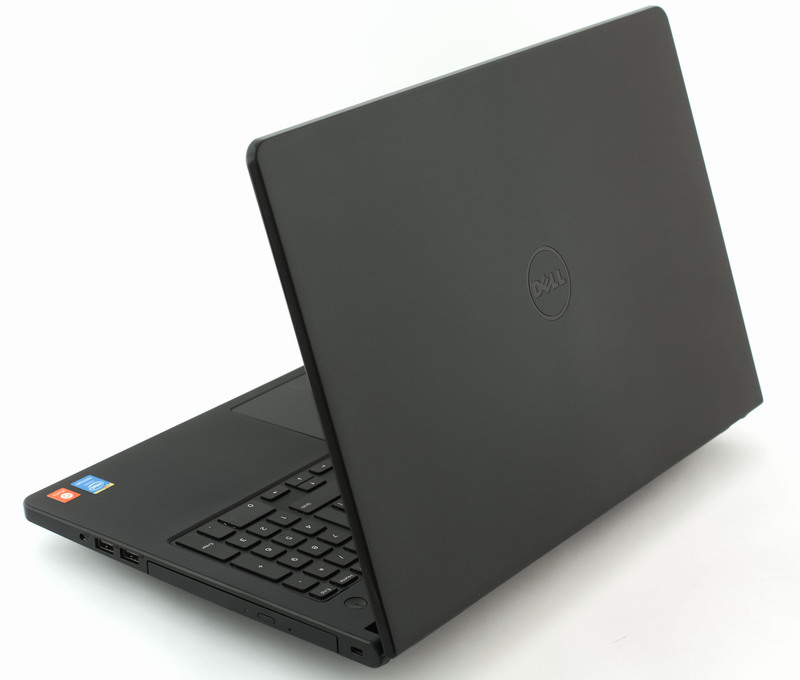 It’s time to shed some light onto some of the budget models from Dell and we’ve prepared a relatively new notebook launched just within a month. We are referring to the Inspiron 5551 that aims to be sold mainly to business customers without wanting to spend too much on the device. The price is modest, just like the hardware it offers, yet the design feels way better than expected. 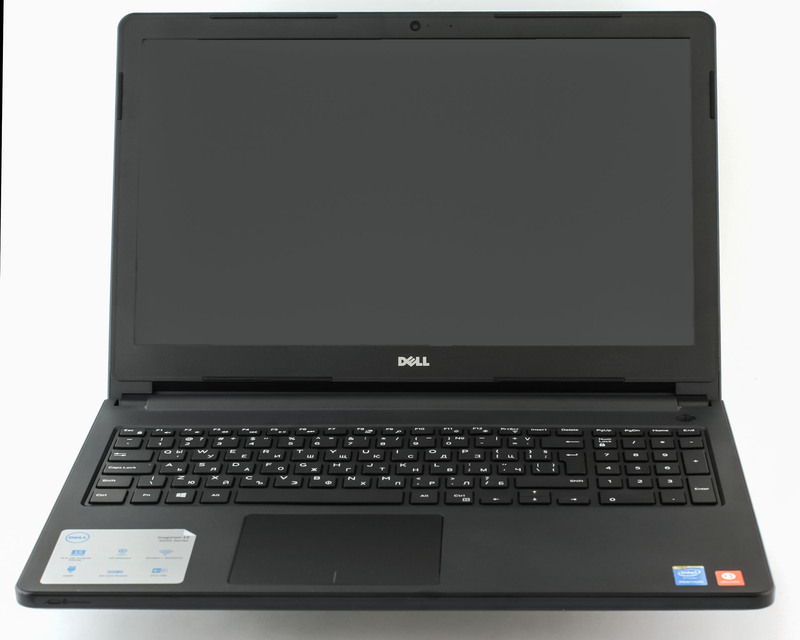 You can easily see the resemblance to the Latitude E5550 as the Inspiron 5551 carries the same design signature, but the build quality, of course, isn’t the same. To be honest, you can’t be too picky in this price range of around €350, but at least we will test the battery life, screen, performance and overall user experience and usability. No matter how cheap a certain notebook is, we are keen to see how it performs with the given hardware especially when low-end and mid-range devices are becoming more and more popular. Thus, prices drop as well as the hardware inside becomes capable enough for running even more demanding applications. The notebook ships with the usual AC charger, cable and user manuals. Nothing special inside. 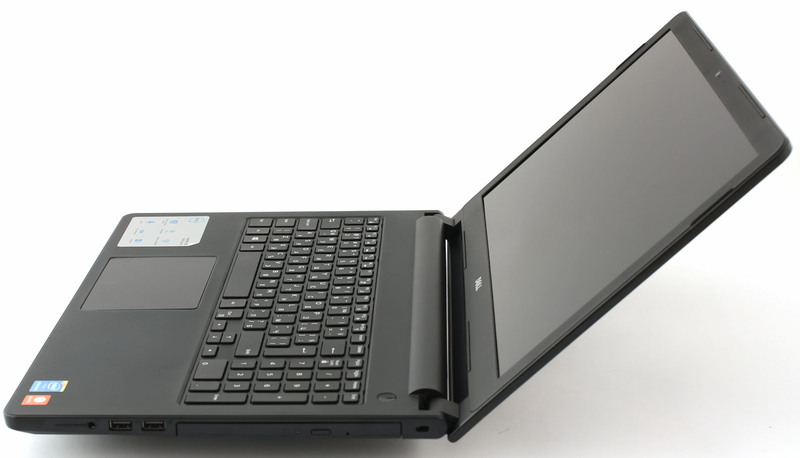 We already stressed on how much the notebook looks (not feels), like the Latitude E5550. It’s light, relatively thin and feels somehow solid in hand. We found no irregularities around the chassis – no holes, gaps and etc. Starting off with the top cover made of plastic with small ornaments on the surface making the lid rough and provides better grip. 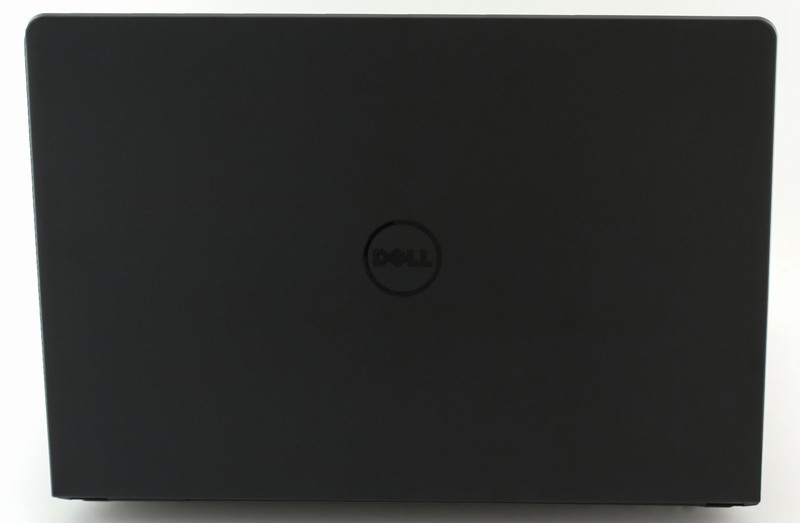 In the center is located the usual Dell logo, but this time with a glossy finish. The other side of the lid accommodates the 15.6-inch screen and webcam. Bezels around the screen aren’t too big either – not too common in this price range. Moving around the bottom materials are the same. 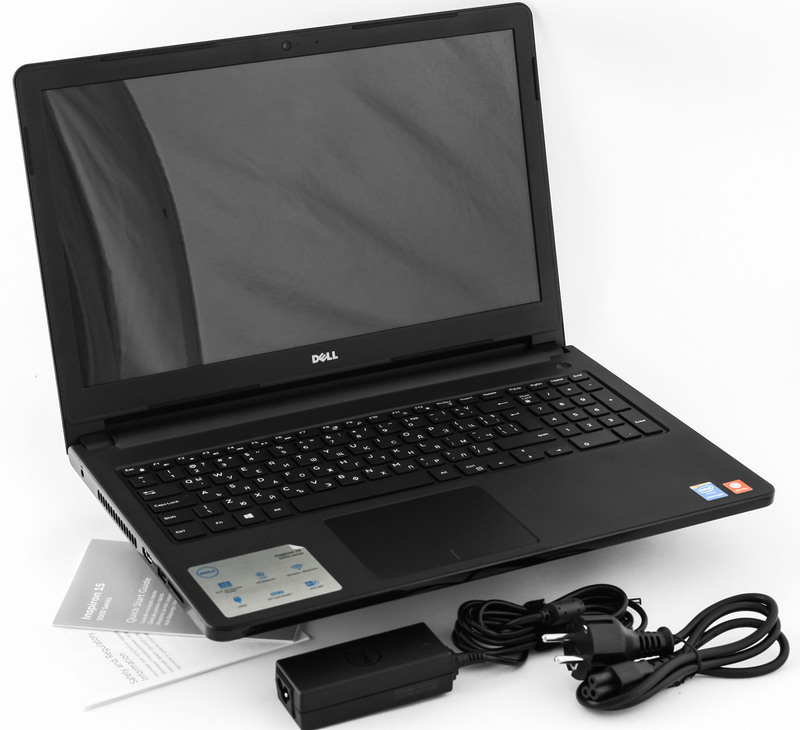 You are provided with an easy detachable service cover for upgrading the HDD/SSD and RAM. The sides are more align with the design signature of previous notebooks from the company. The flat profile with round edges gives a more minimalistic approach to the overall appearance which is more than welcome. Nonetheless, this is somehow subjective opinion on the matter. On the left, you will find the USB 3.0 port, HDMI, SD card reader, DC charging port and the main grill for dispersing the heat. The other way around is the optical drive along with two USB 2.0 ports and 3.5 mm jack for headphones. Opening the lid will reveal roughly the same design as we saw outside. There’s the rough hard plastic around the keyboard. Speaking of which, we are presented with a full keyboard, evenly spaced buttons (with the enter key being oddly small). Buttons feel a bit stiff, but offer enough key travel and to be honest we can’t be too critical minding the price and all. 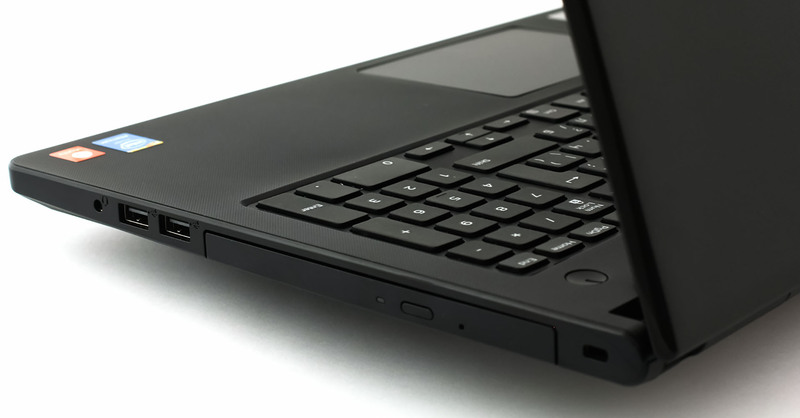 We’ve seen way worse keyboard designs on higher-tier notebooks. Unfortunately, the same cannot be said about the touchpad. It’s made of matte plastic, it lacks the irritating wobbling effect but fails to register some touches and especially mouse clicks. For some reason we experienced inconsistent touchpad performance and even our basic expectations were not met. All and all the notebook is great for the price it ships leaving little room for improvement. Our main complaints are the poor touchpad quality and the lid bends fairly easy under pressure so be careful where you put it when traveling around. Despite that, we are happy with the relatively thin and light design, narrow bezels around the screen and comfortable keyboard. 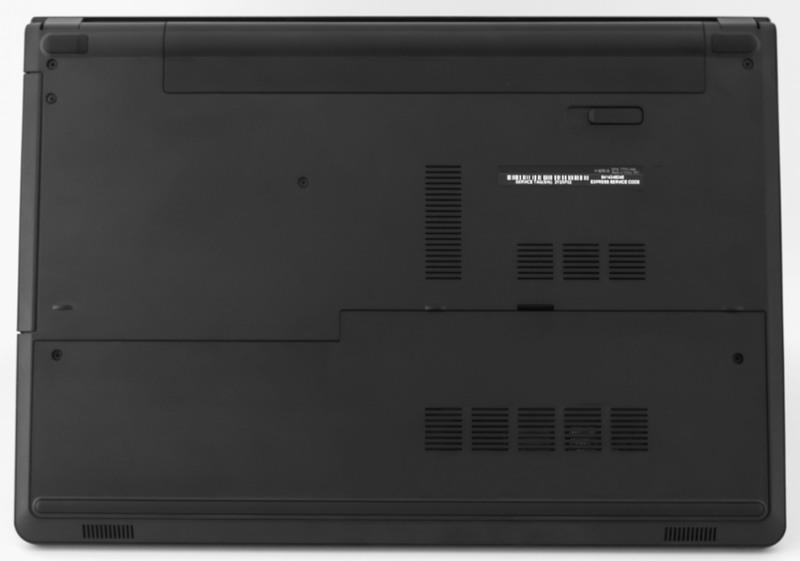 Dell Inspiron 5551’s display uses TN HD (1366×768) panel with glossy finish and 6HTP8-156AT model number. The diagonal is 15.6″ (39.62 cm) leading to a pixel density of 100 PPI (pixels per inch) and pixel pitch of 0.253 x 0.253 mm. The screen can be considered retina when viewed from a distance equal or greater than 86 cm. Viewing angles are poor due to the use of TN panel. Quite understandable for this type of devices. We were able to record a 230 cd/m2 maximum brightness with a deviation of 14%. 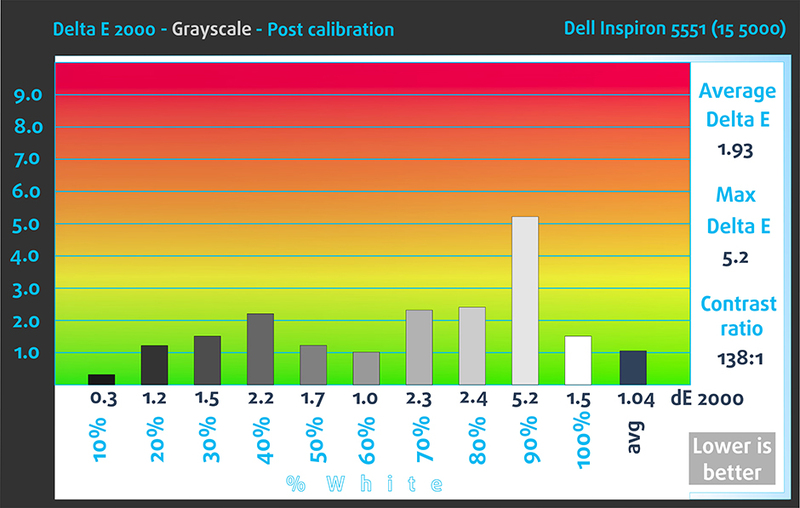 The average color temperature on the surface of the screen is 7185K – a bit colder than the optimal one of 6500K (D65). There’s no significant deviation. 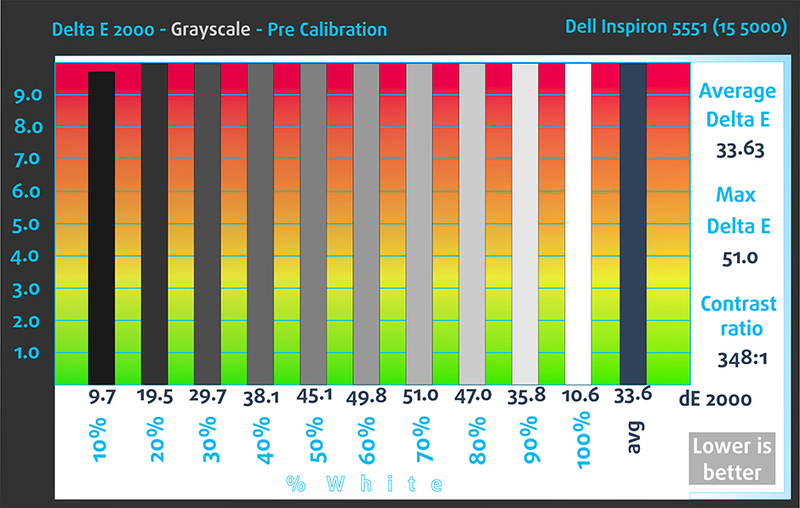 In our case, the notebook’s display covers only 53% of the sRGB and 40% of the Adobe RGB color gamuts. This, again, is one of the main downsides of the TN panel. 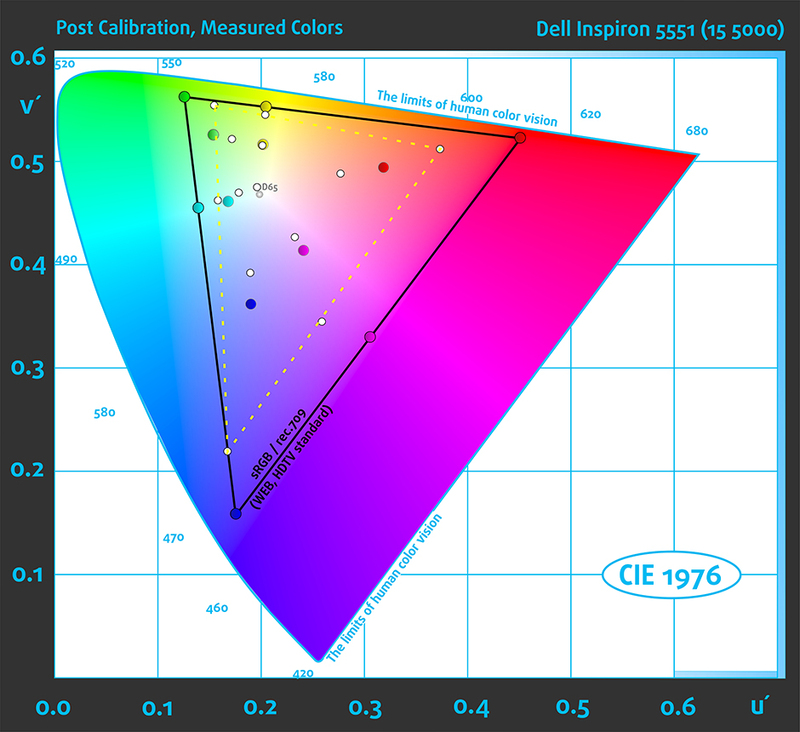 We tuned the display at 140 cd/m2 and color temperature of 6500K. With X-Rite i1Display Pro, we calibrated the display for a better results in our test, but yet again even the calibrator can’t fix the lack of certain colors. Red will appear pale as it will be replaced to the closest color and 100% saturation is impossible. After calibration you can see that the display has relatively well distributed white levels. 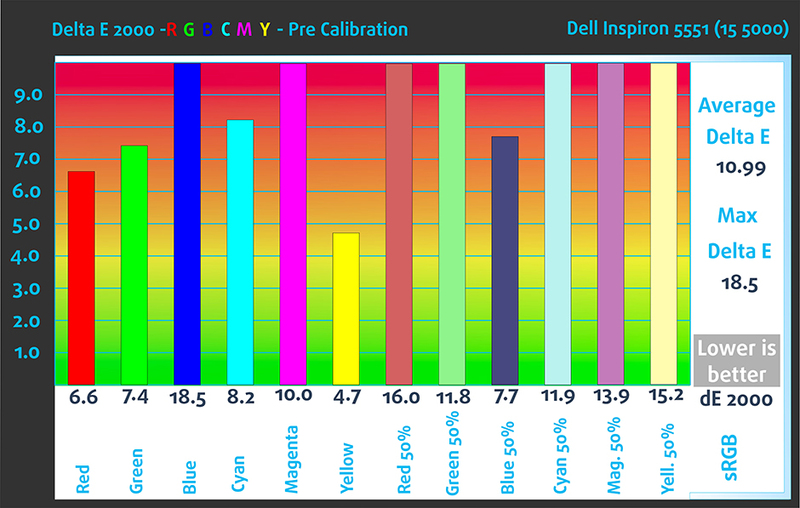 With the help of 24 commonly used colors we checked the color accuracy of the panel. Colors that we used represent skin tone, grass, blue sky, orange and etc. The average DeltaE 2000=2.33. Lower score is desirable. Dell’s Inspiron 5551 uses a panel that controls the brightness with the help of PWM, but aggressive screen flickering occurs only below 25% brightness. Above the aforementioned brightness level, the screen will be suitable for long hours of usage. We recorded the refresh time of the pixels from black to white and white to black for 10 to 90%. So we were able to measure Fall Time + Rise Time = 14.4 ms. 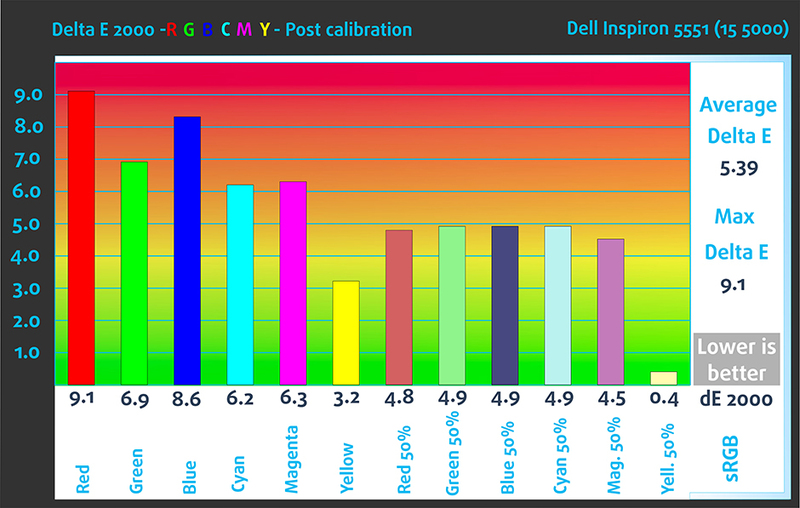 Overall, the panel used for the Inspiron 5551 met our expectations – relatively high maximum brightness, accurate colors after calibration, which is crucial for watching movies, and it’s energy-efficient (it’s a TN panel after all). Moreover, the display is suitable for working long hours because there’s no aggressive screen flickering after 25% brightness. Although, the display has low sRGB color gamut coverage, poor viewing angles and not enough contrast. Sound quality is good with clarity missing on some frequencies. Our subjective opinion on the matter is rather positive. 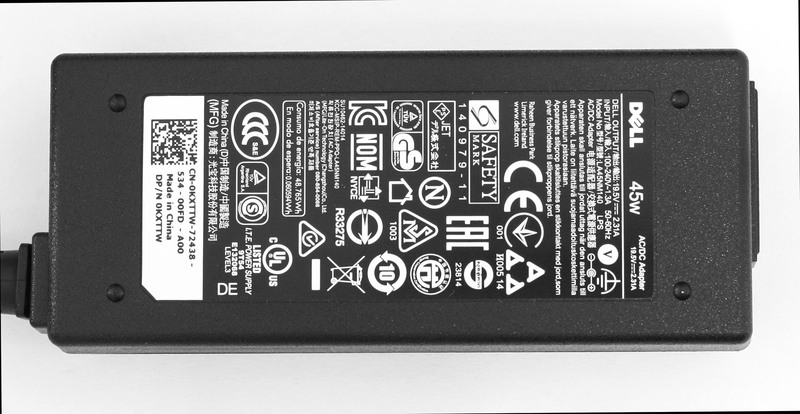 Dell has been using this battery on several models – manufactured by the company rated at 40Wh. It has small capacity, but we can expect good performance due to the energy-efficient hardware. Firstly, we’ve got Intel Pentium N3540 CPU with 7.5W TDP and integrated GPU on our hands as well as TN panel that doesn’t drain too much juice. The notebook can easily beat some of the high-end machines in terms of battery performance and the results are here to prove it. All tests are performed under the same conditions – power saver on, Wi-Fi turned on, Bluetooth off, and screen brightness set to 120 cd/m2. A result way above average and yet somehow not surprising due to the energy-efficient hardware – 396 minutes (6 hours and 31 minutes). Again similar result – 400 minutes (6 hours and 40 minutes). Intel Pentium N3540 is low-voltage, four core processor, announced near the end of Q4, 2013. It is an integrated (soldered onto the motherboard) package, which is part of Intel’s budget line of processors. The chip is based on the “Bay Trail” architecture and operates at a base frequency of 2.16GHz. A typical representative of the Pentium family, N3540 does not support TurboBoost or HyperThreading functionality. Unlike other Pentiums, however, it is outfitted with a technology very similar to TurboBoost, which can increase the clock speed of all four cores to 2.66GHz. Fritz is a chess benchmark which tests the computing capabilities of the CPU with various chess moves. The Intel Pentium N3540 managed to get 4.355 million moves per second. For comparison, one of the most powerful PCs, Deep(er) Blue, was able to squeeze out 200 million moves per second. In 1997 Deep(er) Blue even beat the famous Garry Kasparov with 3.5 to 2.5. Before we begin with this section we would like to note that the following tests do not represent real-life benchmarking. It is virtually impossible to reach 100% CPU and GPU load under normal usage, but we run the stress tests to see how the machine handles higher temperatures and check the overall stability of the system in the long run. 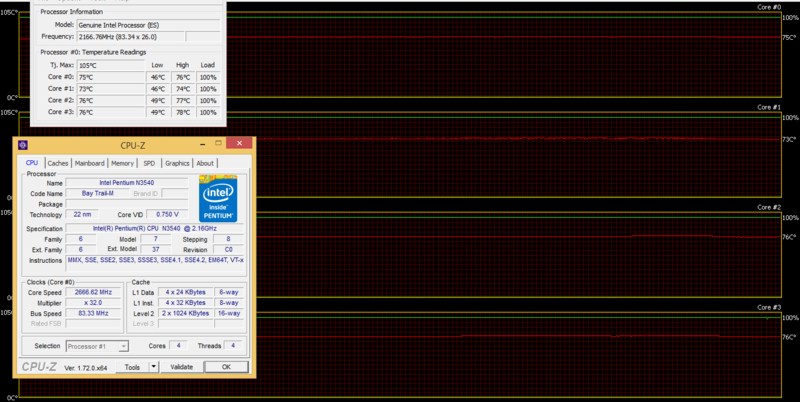 Firstly, we go along with the CPU stress test for about an hour. Under normal usage, the CPU maintained 46 °C and reached as high as 74-77 °C during the stress test which is still far away from the maximum operating temperature of 100 °C. Also, no throttling occurred as the CPU was ticking at 2.66 GHz with that being the maximum operating frequency. That’s a great result whatsoever. You can see the results on the graph below – the green line stands for CPU load as the red one is the temperature. After the first hour we ran, alongside the CPU test, the GPU stress test as well. Temperatures rose for a few seconds up to 84 °C, but the fan cooled the CPU down to 77 °C. However, that wasn’t the most surprising thing. The CPU maintained 2.66 GHz clock speed and didn’t throttle for a second. 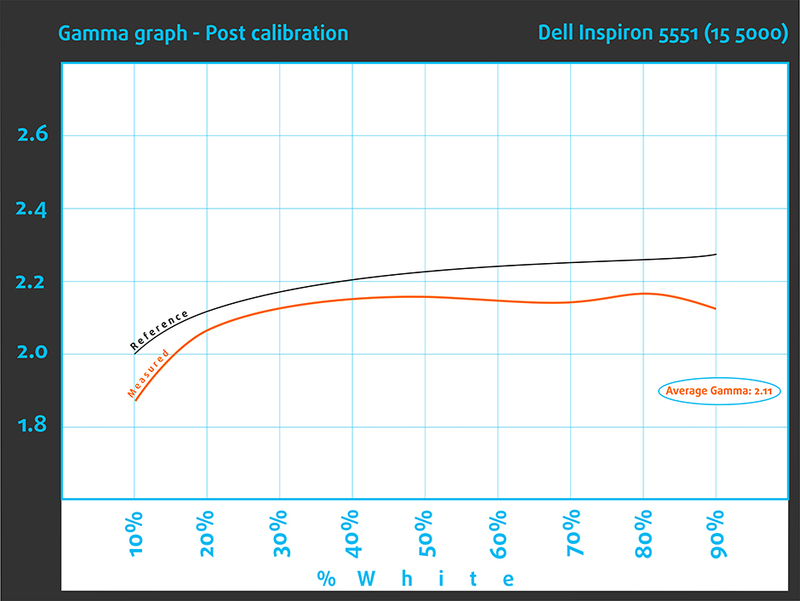 This is really rarely seen even in the high-end notebooks, but the €350 Inspiron 5551 passed the tests with flying colors. You can see the results on the image below. Usually after the stress tests we measure the temperatures on the surface of the machine and see if the cooling system has done a good job. So the Inspiron 5551’s outer case remained surprisingly cool throughout the whole test and we didn’t feel any heat at all. Furthermore, the fan was really quiet and no frustrating buzzing sound was at hand. Dell has really done it this time. 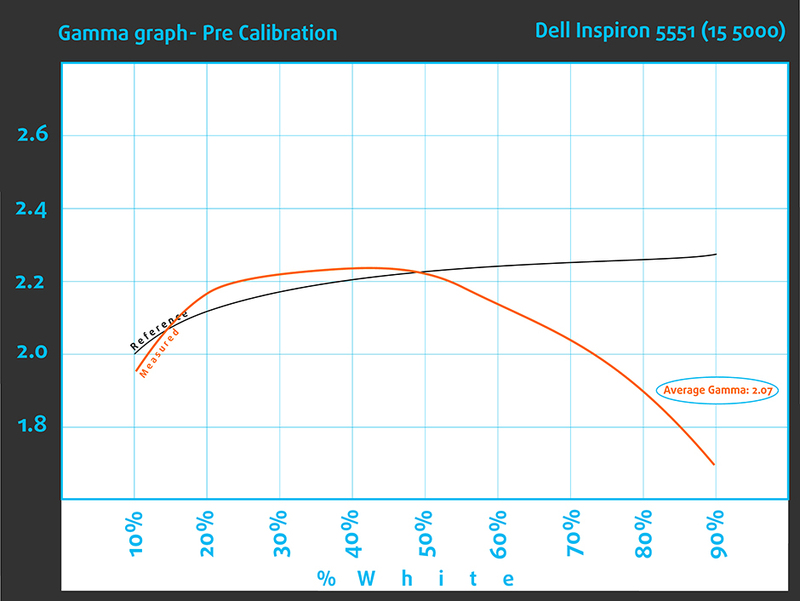 The Inspiron 5551 will be suitable to satisfy all your basic needs and even brings a lot more to the table. For the price tag of around €350 you get a decent working machine with a good overall design, not so sturdy construction, though, but with a relatively thin design and lightweight. The screen isn’t anything special as Dell used TN panel, which is quite understandable given the price range, but do not bee fooled. This screen actually surpassed our expectations – high enough maximum brightness and not PWM (screen flickering) above 25% brightness level. We’ve come across a lot of notebooks this far and quite a few had good readings on our oscilloscope and comes as a big surprise when a laptop that cheap is harmless to your eyes.